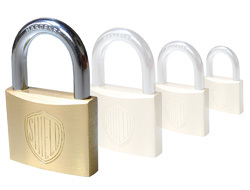 Shield is a UK brand of padlocks and offers great quality at an exceptional price. Every lock is made with a hardened steel shackle, a precision mechanism and high quality brass. It is important to note that padlock quality varies greatly between brands and although excellent, Shield still do not match the German made ABUS locks. We have two key variations available at this time. If this is your first time buying this lock it does not matter which you choose. However, in future you may wish to choose the same key as you ordered before to add to your existing set. 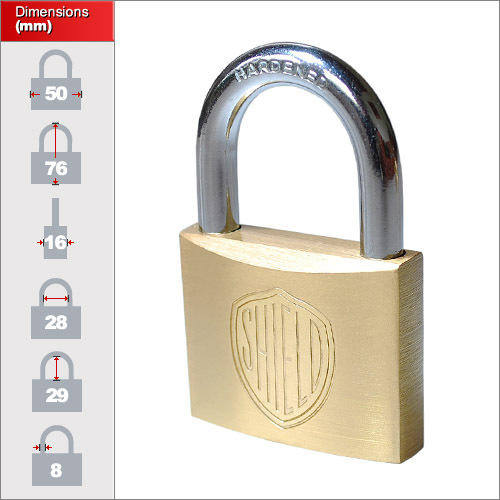 We currently offer four sizes of standard brass padlock: 20mm, 30mm, 40mm and 50mm. Proportion and design remains the same throughout the sizes but with added size comes added strength and security.The choice of size is dependent on the application and security required. Please choose your required size from the drop down list and click on the photo for exact measurements.